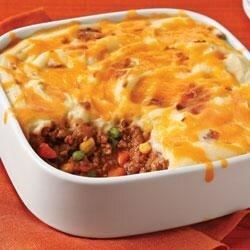 "An easy shepherd's pie made with lean ground beef has a light but flavorful layer of creamy mashed potatoes on top." Heat oven to 375 degrees F. Drain potatoes; return to pan. Add sour cream; mash until potatoes are smooth and mixture is well blended. Stir in 1/4 cup cheese. this was really good !! as it was cooking i had my doubts. i added salt and pepper, and substituted PLAIN YOGURT for sour cream (much healthier) - the result was yummy. I made this tonight and found it to be quite bland. Won't be making this again. I have made this several times and my family loves it! It's so easy and instead of making the mashed potatoes, I use Bob Evans Original mashed potatoes and it tastes delicious! Definitely quick and easy. I did season the meat with salt and pepper for some more flavoring. This was my first attempt at Shepherds Pie and I will definitely be making it again. The only thing I added was salt and pepper. Otherwise I followed the recipe exactly. It was very good.